Located on Keawakapu Beach on the sunny side of the island, the Mana Kai is a condo complex of 98 privately-owned, luxury two bedroom, two bath units. Walk down the beach to Wailea and the luxury beach front hotels--The Grand Wailea, Four Seasons, and Fairmont's Kea Lani. Play golf at the world class courses at the Blue, Gold and Emerald courses at Wailea or the Makena courses, just a five minute drive down the road. There is also great shopping at the Shops at Wailea, and Kihei Town is less than a mile up the road. The Mana Kai has recently undergone a multi-million dollar renovation that includes a complete remodeling and expansion of the swimming pool. A large lawn area provides sunbathers an option to the sandy beach mere steps from the complex. We purchased our unit in 2008 as our part-time residence. We completely remodeled it, including replacing the tile floors, expanding the kitchen, installing new kitchen cabinets, granite counter tops and top of the line appliances (Bosch range, dishwasher and microwave, GE full-size refrigerator/freezer), new bathroom cabinets, sinks, toilets and showers, new paint throughout and new furniture, including two king-sized beds, two flat-panel high-definition TV sets, a Bose music system and a completely upgraded air conditioning system for the entire unit. A keyless lock system means you never have to worry about locking yourself out or losing a key at the beach. Chairs, umbrella are also provided at no charge. And needless to say, it comes fully stocked with all the necessities of home that you would expect from a turn-key, top of the line condominium. We re-decorated in 2013 buying a new corner sectional sofa. What made this possible was moving the TV to a new custom cabinet that sits at the foot of the bed. A remote control raises and lowers the television for viewing in the living room. The TV swivels so you can also watch it in bed. No other unit at the Mana Kai has this feature. 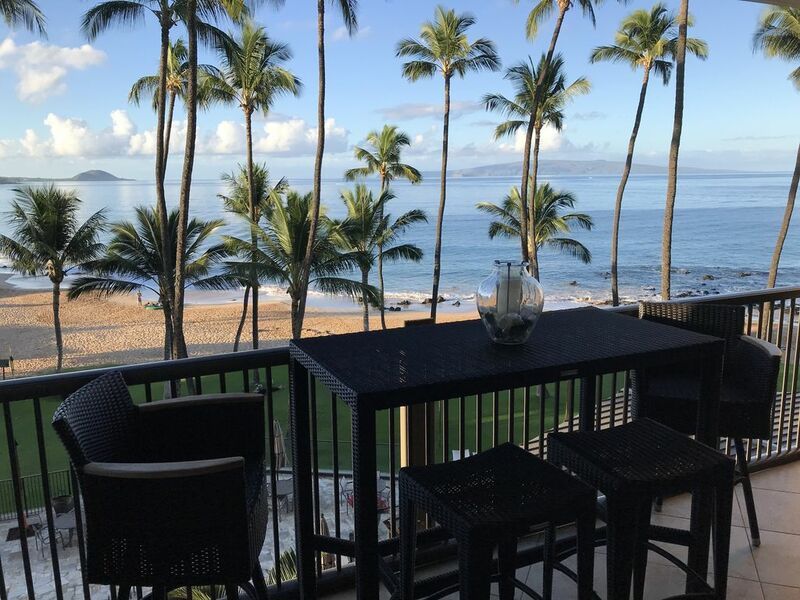 Wake up in the morning, look to your left and watch the sun rise over Haleakala volcano from your balcony while you check your email using our free wireless internet. Look the other way and watch the sun set over the Pacific between Lanai and Kaho'olawe every evening sipping a cocktail. In between you can watch the whales (5,000 spent the spring here in Maui this year) or just sit and watch the paddle boarders, sunbathers and snorkelers down below. Keawakapu Beach is routinely voted one of the most beautiful beaches in Hawaii and is home to multi-million dollar homes down its half mile length. Because of its north/south orientation, waves rarely break over a couple feet, so it is extremely kid friendly. Snorkeling off our point is some of the best on the island. The Five Palms Restaurant is located downstairs. It has been voted the best breakfast place in Maui, has an excellent happy hour at the bar from 3 to 6 daily, and offers gourmet dining nightly. Zack's Deli is located at the other end of the complex and sells sandwiches, food staples and a wide variety of wines and liquor. An on-sight activity desk can help with excursions such as a sunset dinner cruise, a luau, snorkeling off Molokini or riding bikes down Haleakala. And for you yoga enthusiasts, Maui Yoga Path offers daily yoga classes taught by renowned Iyengar yoga instructor, Deni Roman. In 2016 the resort remodeled the basement of the building and built a state-of-the-art work out facility, a new conference room that can hold up to 12 people, and a business center. The picture down the beach was taken on a typical late afternoon from the balcony. You can see why couples get married right on the beach several times a week--it is a magical and memorable place, and it is waiting for you and your family. Check out our new video which does a good job of showing the interior of our condo, the views down the beach, and highlights many of the nearby amenities. So why stay in 306? You have many choices when you are deciding where to stay in the Mana Kai. All 98 condominiums have identical floor plans; many have been recently remodeled; and some are closer to the ocean or on higher floors than others. Why do we love ours? As you can see from the pictures, we completely remodeled our condo when we bought it, and have made many additional improvements over the years. Deanne is a designer in the Bay Area and her choice of colors and furnishings are unique and beautiful. We live here part of the year. It is more than a rental property to us. We buy the kind of things you would put in your house: high quality dishes and silverware, pots and pans and kitchen utensils. We also regularly replace linens and towels rather than wait for them to wear out, and needless to say, we buy the kind of sheets you would want to sleep on at home. We would like you to think about our condo as your home away from home. Generally, condos that are on the ocean side of the building and on higher floors can accommodate higher rental rates. We are slightly contrarian to this view. While you would want a top floor penthouse if you were staying in downtown Manhattan, we believe that higher up only makes you further from the sounds of the waves and the view down the beach. Being on the third floor is just right. We also have unobstructed ocean views in our back bedroom where many other units look into the stairwells or the elevator shafts. Please email me if you have any questions. Mahalo. When our youngest of four children went off to college my wife Deanne and I figured it was time for us to quit the rat race and spend time doing the things we have dreamed about over the years. Scott quit his job as a VP and General Counsel of a Silicon Valley semiconductor company, we sold our house in the San Francisco Bay Area, and bought a condo at the Mana Kai Maui. Our extended family had vacationed here for several Thanksgivings so we knew what we were getting into--our piece of paradise. This picture includes Scott, Deanne and two of our four children--Kevin and Allison, sitting on the patio. The Mana Kai is so close to the ocean that when we first arrive we have to close the window because the waves are too loud. We take daily walks down the beach and let the warm water wash over our feet and the trade winds blow through our hair. I get up early and watch the sun rise over Haleakala and then, from the same seat on the patio I watch the sun set in the evening. Magic. Keawakapu Beach is beautiful and very family friendly. The waves rarely break over one or two feet, so young children are free to frolic in the water. Wonderful snorkeling is right on the point. During the Spring you can watch the whales literally jumping out of the water. Scott enjoys golfing and there are four world class golf courses within a five minute car ride. While Scott is golfing Deanne likes to go to the Spa at the Grand Wailea. This condo in Mana Kai was excellent. Great location in Kihei along a beautiful stretch of beach. Nearby restaurants are wonderful. Amenities are great. Highly recommended! Wonderful accommodations! Lovely location and beautifully decorated. We loved the Mana Kai and this condo particularity. Nicely updated, best location on Maui and the pool was even warm which is tough to find! Great location, after spending the day loafing on the beach, just outside the door, could not think of a better place to get ready for the evening and having a drink to get ready for dinner. Condo was very clean and greatly decorated. Had a few questions of the owner, when I emailed him, he returned my emails within an hour or two. Great place and great owner to deal with. Will return!! Amazing views on an amazing beach! As former Maui residents we were already familiar with the location and facilities of the condominium complex. The unit is well equipped and nicely decorated. We were expecting the unit to have it's own washer/dryer so renters should be aware that the washer/dryer facilities are on the same floor but it does cost $6 to do a load of laundry ($3 to wash, $3 to dry). A problem with the hot water was resolved within 24 hours and the owner responded quickly to any questions we had. We would definitely stay here again. Great location for a family vacation. Excellent ocean and sunset views. Steps from the beach! This was our first trip to Maui and we definitely stayed at the BEST place. Scott's condo is superb - well stocked with essentials and extras, nicely decorated, very clean, and the view was amazing. Communicating with Scott was so easy - he responded to both texts and emails quickly and was happy to offer suggestions for local places to eat, etc. He was very accommodating when our travel plans changes unexpectedly as well. We utilized the beach chairs, beach towels, snorkels and masks daily - even saw multiple sea turtles right off the beach. The staff at Mana Kai were very helpful as well. We booked surf lessons and rented SUP from the surf shop located there. The 5 Palms Restaurant below had a great happy hour with yummy food and cocktails. We can't wait to visit Maui again and will definitely be booking this condo when we do. Situated on Keawakapu beach, consistently voted as one of the best beaches in Hawaii. Excellent snorkeling steps from your front door. Unbeatable, unobstructed views down to Wailea Point and Makena.